If you’ve never attended the Annual General Meeting before on the assumption that it would be a totally boring, long drawn out business meeting then you have assumed wrong! This year’s meeting was special – sad and happy at the same time. Elaine Buckley was retiring as chairman after a marathon 3-year stint at the helm (that was the sad bit) and Jean Bartlett took over the role after having served as Elaine’s deputy (that was the happy bit). As Elaine handed over her Chairman’s badge; Jean’s first task was to present Elaine with a quilt that had been made by members of the committee (and beautifully quilted by Val Thomas). 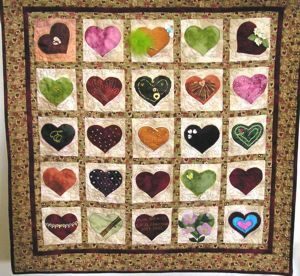 The quilt was called ‘Heartfelt Thanks’ – each committee member had made an appliqué heart block on which they had been given free rein to embellish. The business part of the day was kept short and so we were then able to enjoy two quality guest speakers. 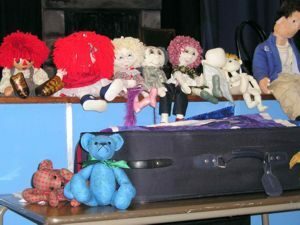 In the morning we were treated to a parade of cloth dolls and teddy bears that had been made by Jane Hilary Parker. All the dolls and teddies were passed around the audience so we could have a closer look and of course each person had to check that the dolls were wearing knickers! (can someone please tell me why we all do that?). Some of the dolls were amazingly life-like and ranged in size from new born to toddler – Jane even takes her dolls on shopping trips to Mothercare to buy their shoes! Each doll seemed to have a different personality, their facial features being created with machine embroidery and they were certainly by far the best I’ve ever seen. My favourites were the teddy bears with their moveable limbs and heads, and chubby tummies complete with growlers. By the time you receive this newsletter Jane’s website should be up and running (www.curvycreations.co.uk) so, hopefully, you will be able to see for yourself. Although there was an hour for lunch by the time we’d visited the two traders, looked at items on display, bought raffle tickets, visited the Sunset Trust sales tables (where there is always a bargain to be had!) and caught up with old friends there was barely enough time to eat our sandwiches before we were off again on the afternoon session. 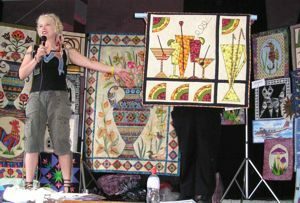 The afternoon guest speaker was Anja Townrow – I’m sure that most of you will be familiar with her work as she is regularly featured in quilting magazines and can often be seen demonstrating foundation piecing at the main quilt shows. Anja was a thoroughly entertaining and generous speaker as we were allowed to inspect her quilts at close quarters. My only regret is that I didn’t book to do her workshop on the following day – let’s hope we invite her back again soon! Well that was the day over – the sun had been shining all day but we had been too busy enjoying ourselves to notice! So ladies, if you’ve never been to one of these days before I hope this report has given you a taste of what goes on and perhaps you’ll come and join us in the future. Finally, may I just take this opportunity on behalf of the ordinary members to thank Elaine for all her hard work and efforts over the past 3 years – we shall miss you. Also, to welcome Jean to her new role – you have our best wishes.